About Teeth Whitening Toothpastes, Strips and Gels. Do They Work? Even though these products do help to whiten teeth, you cannot find over-the-counter whitening toothpastes, gels or strips that will be able to be as effective as what you will receive from our dental office in Sidney, OH. Many of our patients in Sidney, OH often as us about the variety teeth whitening products available for home use and what the effectiveness of these products are. Starting with whitening toothpastes and moving on to whitening gels and strips, we will take a look at these products and how well they work on teeth whitening. Typical toothpastes contain mild abrasives. These abrasives work to help remove stains on the surface of teeth. With the variety of whitening toothpastes, these pastes may also contain polishing or chemical agents provide somewhat more effectiveness in getting stains removed from teeth. Whitening toothpastes only work on the surface of the teeth and they do not contain bleach. Looking at other over-the-counter whitening products such as whitening gels and whitening strips, you will find that they typically contain an ingredient of such as hydrogen peroxide (a form of bleaching substance). Stain removal will go a little deeper into the tooth with hydrogen peroxide products and will also work on the surface of the tooth. Even though these products do help to whiten teeth, you cannot find over-the-counter whitening toothpastes, gels or strips that will be able to be as effective as what you will receive from our dental office in Sidney, OH. The professional grade bleaching we offer will be the most effective option in getting your the brightest and whitest smile available. As far as color shades go, whitening toothpastes are effective up to about one shade lighter. Home use whitening strips and whitening gels contain a significantly lower level of peroxide than the professional grade products available in our dental office. Because of this low concentration in over-the-counter products, the desired effectiveness is also be much lower. Professional teeth whitening results from our office, depending on the individual patient can range from three to eight shades lighter. Using over-the-counter products maybe convenient but having your teeth whitening done professionally by Dr. Van Treese will give you the benefit of his knowledge and supervision as well as his expertise in selecting the optimal whitening process for you. Dr. Van Treese will also keep a check your progress make sure you do not experience any kind of discomfort such as gum irritation. 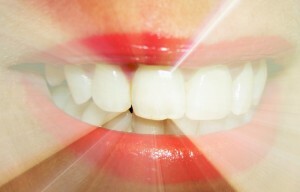 For more information on teeth whitening can be found at the American Dental Association.